The Financial Times plans to invest heavily in a brand experience campaign this summer, aimed at supporting its recently-launched global marketing push for the FT Weekend section. As part of its plans, it has just hired Tamara Gates, formerly with TV, film and ad production and visual effects specialists Moving Picture Company, in a new role as experiential marketing manager. Her remit will include managing the planned brand experience activities. 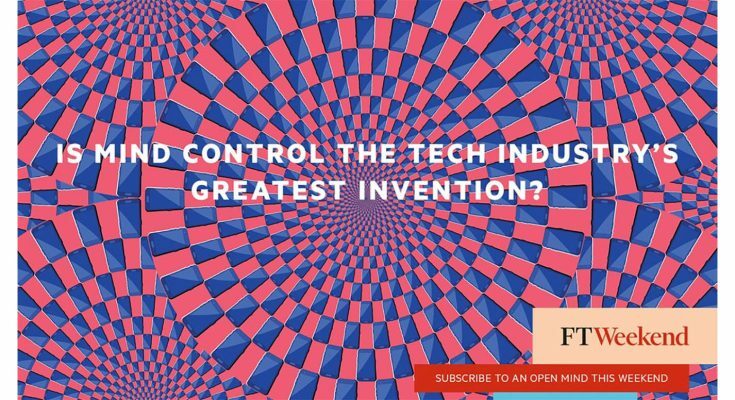 The new Open Minds campaign for FT Weekend was inspired by the section’s colourful and provocative journalism and aims to encourage stronger engagement with FT Weekend by the FT’s core business audience, while attracting new readers to its world-class coverage of arts, culture, ideas and lifestyle. The campaign, which builds on a 2017 refresh and rebrand of FT Weekend under editor Alec Russell, will have two phases. The first will include out-of-home, digital display, online video and retail elements in high profile locations in London, Hong Kong and New York’s Times Square. The second phase, in the summer, will have a major experiential focus, marking a new direction for the Financial Times. ‘Is mind control the tech industry’s greatest invention?’ (pictured) challenges readers to question their relationship with the smartphone. The campaign will be supported by social media activity on the FT’s Facebook, Twitter (@FTWeekendand @FTLifeArts) and Instagram (@FT_Weekend) accounts with the hashtag #FTOpenMinds. The articles which inspired the campaign can all be found outside the FT’s paywall at FT.com/OpenMinds. The Financial Times is one of the world’s leading business news organisations, recognised internationally for its authority, integrity and accuracy. The FT marks 130 years in 2018 with a record paying readership of more than 930,000. The FT is now a majority digital content business, with digital subscriptions up to 739,554, representing more than three-quarters of the total paying audience. Content revenues represent almost two-thirds of total revenues, double the share of five years ago.